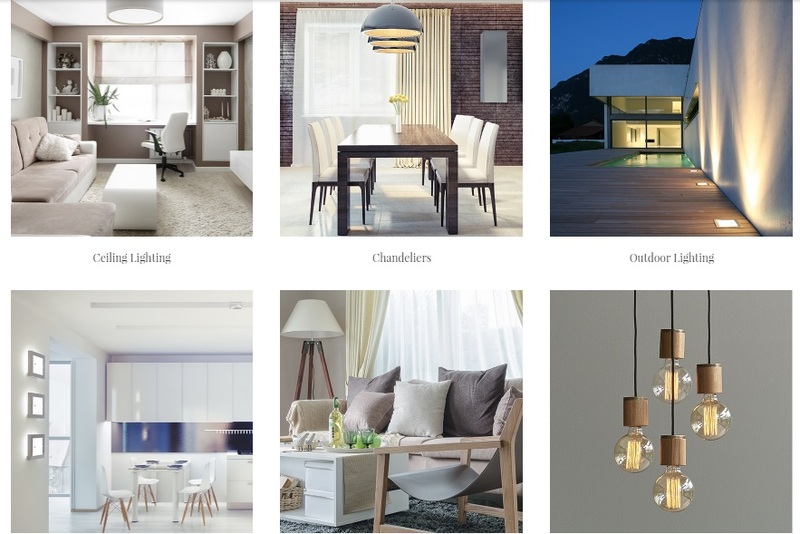 Today, we shed light on a new Magento 2 template designed to create stunning ecommerce lighting stores on the basis of the platform. 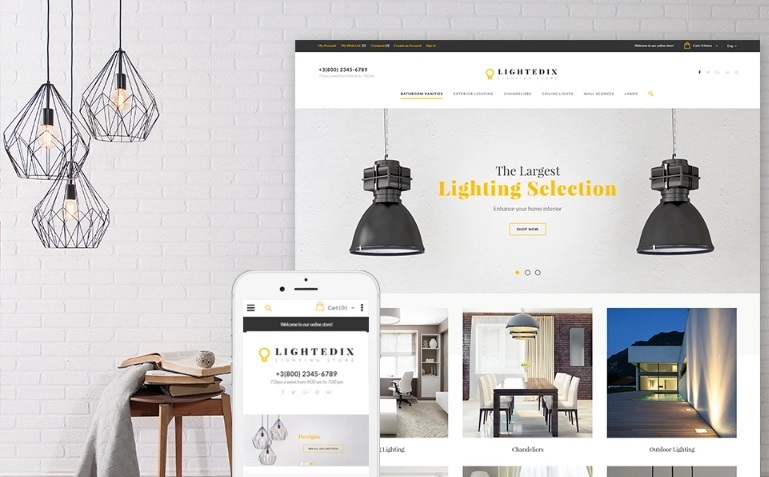 Meet the Lightedix Magento 2 theme – this solution will help you get a fully-featured storefront in a matter of a few clicks. Also note that the template includes more than a dozen Magento 2 modules, so you don’t have to install any additional extensions. 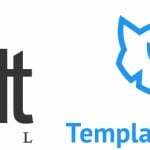 At the same time we provide several plugins that improve the functionality of the template even more. 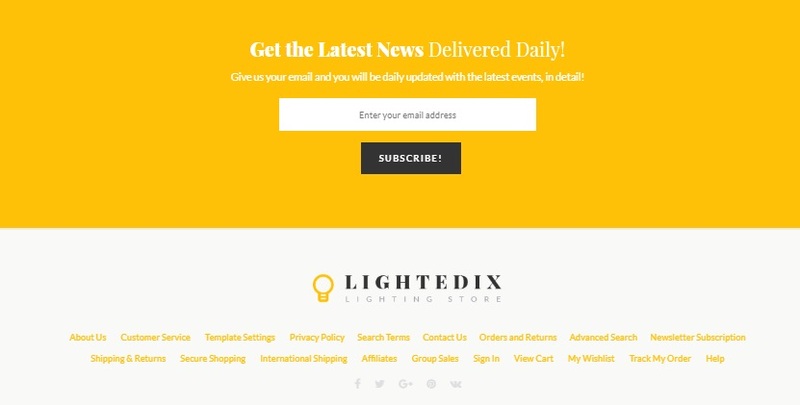 As every modern Magento template, Lightedix is fully responsive. 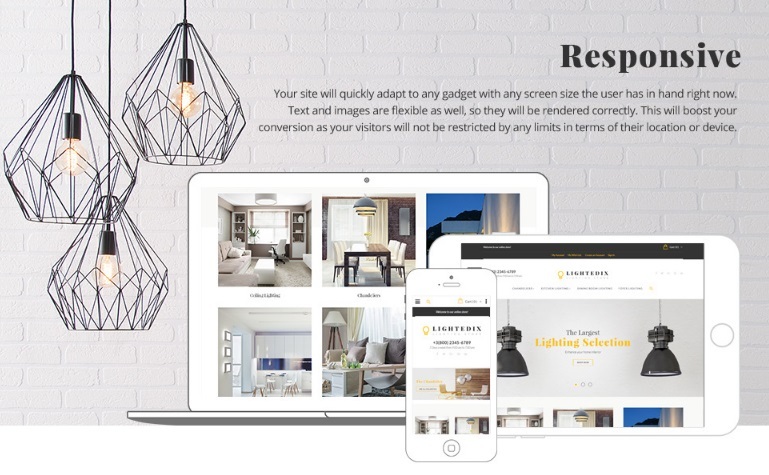 It means that your lighting ecommerce storefront is easily accessible from smartphones and tablets. Furthermore, visitors get the same great shopping experience on all screen sizes. Better navigation through categories is possible due to the Mega Menu extension that allows to revamp the default experience. The tool allows to add any additional links and enhance menu items with various visual content. As a result, you provide customers with an engaging and self-explanatory main menu where all elements are situated on the right place. A more powerful solution is represented by this module: Magestore Mega Menu Magento 2 Extension. AJAX search becomes extremely helpful as well. It is not only faster than the default Magento 2 search, it also supports autocomplete functionality and provides visitors with categories and product pages. The more characters are typed, the more precise the selection is. Product badges or labels are also an important improvement. They don’t help to surf through your ecommerce lighting store, but are very effective at attracting attention. You can highlight new goods, sales, or special product features. Don’t use too many badges, since their effectiveness will be decreased. The best product label extensions for Magento 2 are compared here: Magento 2 Product Labels Comparison. 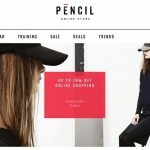 As for product carousels, they are designed to promote goods right on your homepage. Add as many items as you need and make your main landing page more engaging and appealing to customers. The same goal is achieved by image slider. 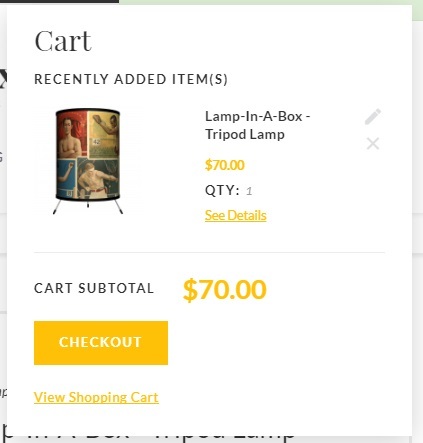 Unlike product carousels, it doesn’t allow to add products to cart, but the tool is still effective in promoting sales, special offers, and new arrivals. The header section of the homepage is divided into multiple rows. The first one contains a space for a welcome message, a mini cart widget icon, and a store view switcher. Next, there is a row with various links: My Account, My Wish List, Create an Account, Sign In, and Blog (You can discover more blog extensions for Magento 2 here: The Best Blog Extensions for Magento 2). The third row includes contact number and business hours, brand logo, and social buttons. The last row contains main menu and search icon. When you scroll the page down, it acts as a sticky element, but without the search icon. And check the difference between the ordinary menu item and the mega menu item. The aforementioned image slider is situated below the header. It contains catchy images, engaging texts, and CTAs. Next, there is a section that visualizes various sub-categories and allows to proceed right to them shopping only certain products. 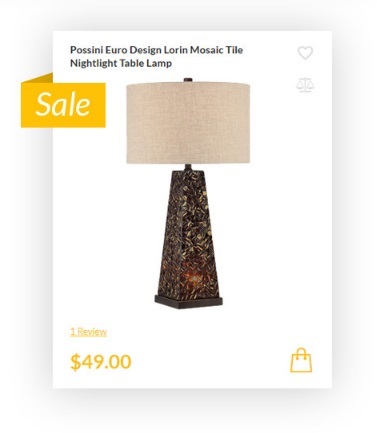 It shows product name, image, and price. You can add a product to cart/ wish list/ compare. The newsletter subscription section is also available on the homepage. Below, you can find a minimalist footer with useful links. 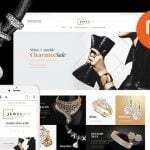 The category page of the Lightedix Lightning Store Magento 2 theme looks quite unique in comparison to other templates because it has a horizontal layered navigation menu. You can still apply only one filter parameter at a time, but the amount of available items is displayed in front of each option. To improve the default layered navigation functionality, install one of these modules: Magento 2 Layered Navigation Comparison. As for sorting options, the theme allows you to show 9, 15, or 30 items per page, sort items by name, position, or price, as well as switch between grid and list layouts. The product display is absolutely the same as in case of a product carousel described above. 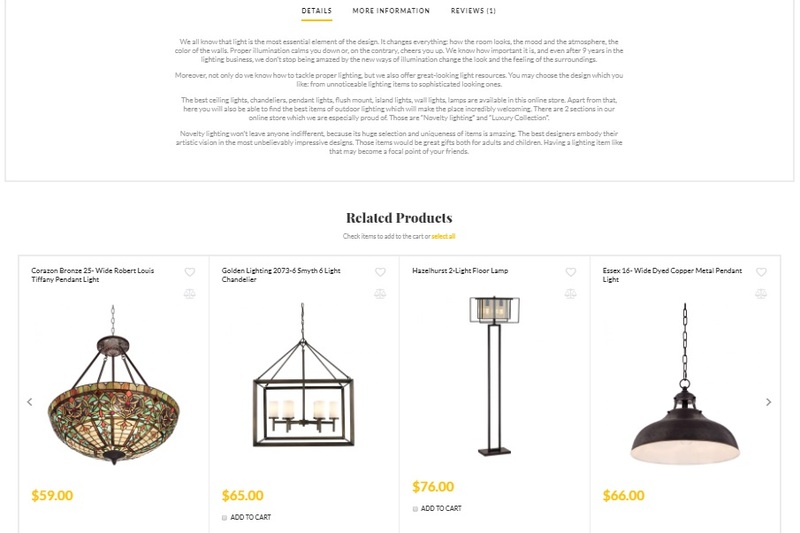 As for the product page, it shows product images and videos, in stock availability, SKU, product name, price, short description, reviews and rating, various configurable options, and add to cart/ compare/ wish list + send to friend buttons. Below, there are three tabs: Details with full description, More Information with grid, and Reviews where you can view and add reviews. 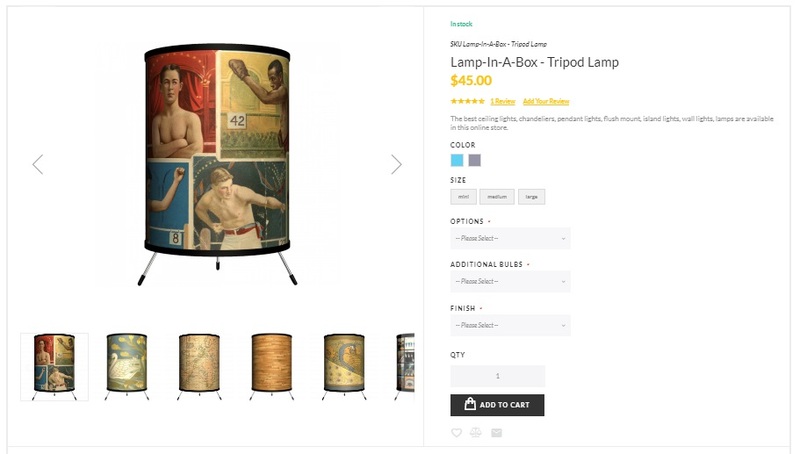 The carousel with related products is also a part of the product page. You can easily edit the content of your shopping cart on any page due to a mini cart widget. A tiny window allows to view product details and edit them. 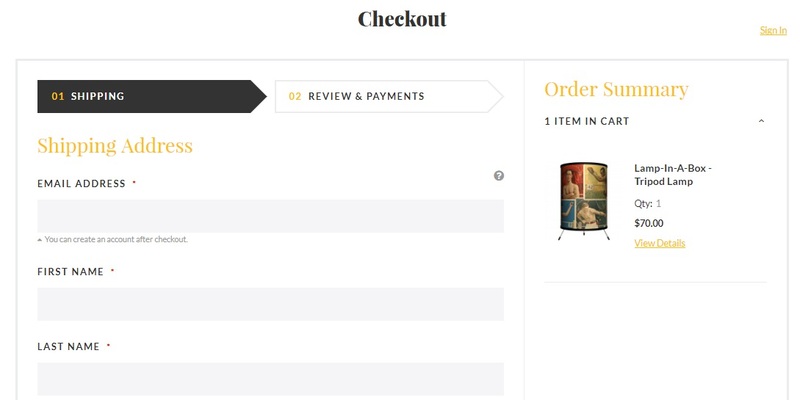 Besides, it illustrates cart subtotal and provides the ability to proceed to checkout. The full shopping cart provides a little bit more features. You can still view and edit items as well as continue shopping and update cart after performing changes. At the same time it is possible to clear shopping cart, calculate shipping and tax, and apply discount codes. As for order total, it is displayed in the Summary section. The best shopping cart Magento 2 modules are here: Magento 2 AJAX Cart Extensions Comparison. The checkout page of the TemplateMonster Lightedix Lightning Store Magento 2 theme looks neat but it still consists of two steps. You must specify shipping details to provide payment information and review your order. The Order Summary section is displayed on the right.